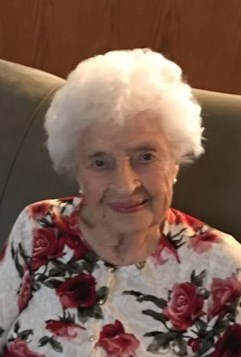 Susan (Grady) Mills-Moriarity passed away February 9, 2019 at 99 1/2 years old. Sue was born August 3, 1919 in Duluth, MN to Lela (Farrell) and R. Armistead Grady. She graduated from Stanbrook Hall in 1937, the College of St. Scholastica earning a Bachelor of Science degree, and a Master of Education degree. She taught at Hermantown High School for 29 years and was past President of both the Duluth Retired Educators Association and Minnesota Retired Educators Association. She was active in many organizations earning a nomination for Port Cities Woman of the Year. Sue was a lifelong member of Our Lady of the Rosary Cathedral. Preceded in death by Bernard Mills (father of her children), second husband John Moriarity, son-in-law Jack Osterberg, parents, and four siblings. She is survived by her children Bud, Jim (Bev), Susie Osterberg, Kathie (John) Trotta, Charlie (Gayle), Pat (Dana), Michael, and bonus daughter Patti Washnieski, fifteen grandchildren, and twenty-five great-grandchildren. Visitation will be held on Saturday February 23, 2019 from Noon until the 1PM Mass of Christian Burial at Our Lady of the Rosary Cathedral 2801 E. 4th Street Duluth. Burial will be in Calvary Cemetery. Arrangements by Dougherty Funeral Home. 600 E. 2nd St. Duluth, MN 55805.